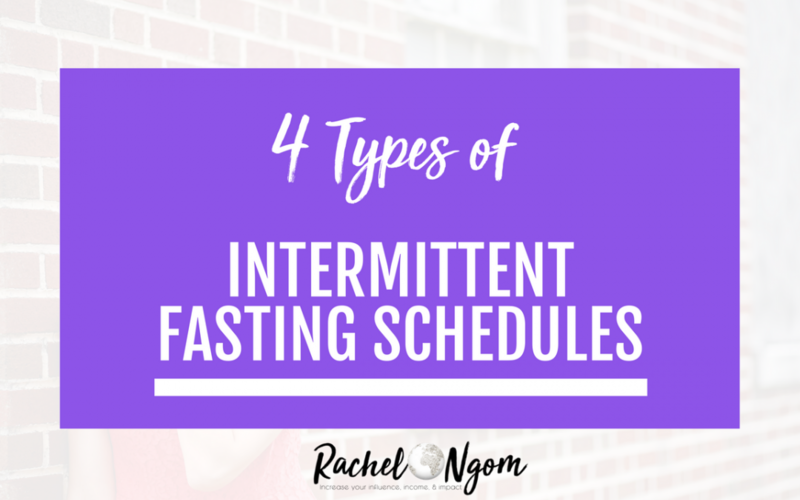 Intermittent fasting is essentially just eating in a condensed window…so instead of eating all day, you’ll pick a window that’s convenient for you and eat all of your calories in that window. 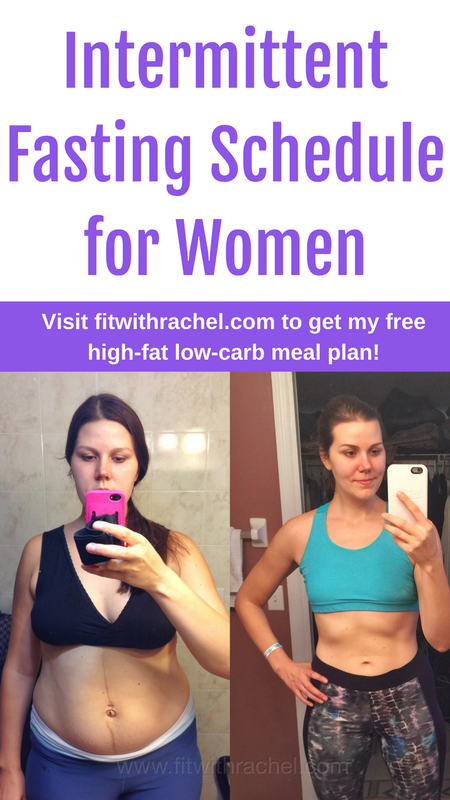 There are several intermittent fasting schedules that you can follow that I’m going to cover in this post. Keep in mind that I don’t ever say I follow one specific diet or intermittent fasting schedule. As someone who has suffered from disordered eating habits (why I co-created The Food Freedom Project), it’s just best for me to be super duper flexible with my approach to food, which is what I am always going to recommend. 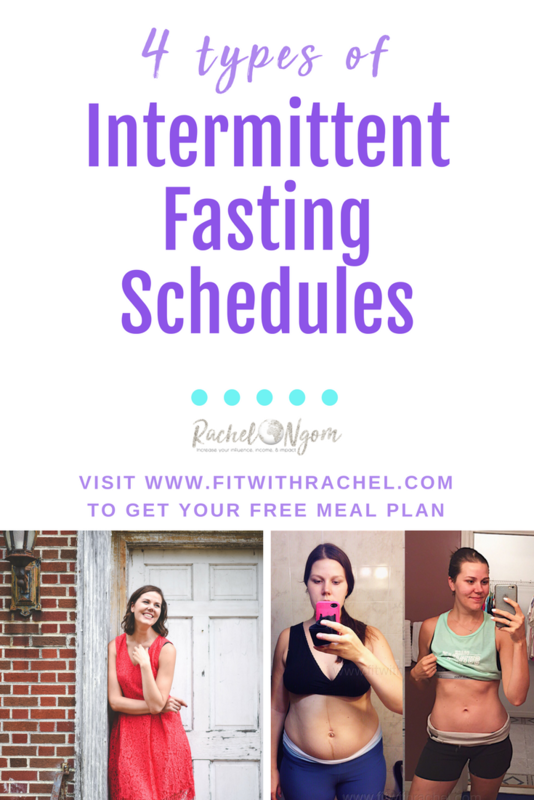 When I first tried intermittent fasting, I read about all of the benefits of intermittent fasting and wanted to give it a try! I forced myself to fast, was super hungry, and it really started to bring up those old issues I had with food again. 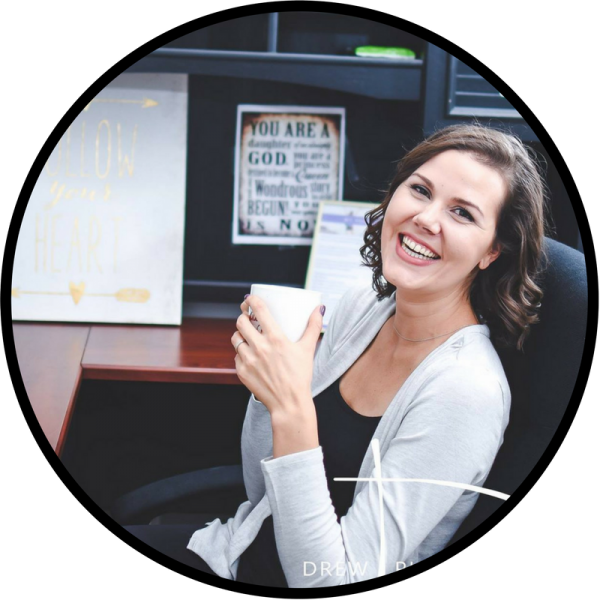 I didn’t experience the clear-headedness from fasting that I was told I’d feel…I felt more like I was going to pass out. I was hungry and irritable. About a year later, I started experimenting with a high-fat diet. And something happened…I started fasting naturally!! It was crazy! I literally went 19 hours without eating and wasn’t even hungry! I wasn’t irritable or shaky and it just felt natural. That’s what I suggest you do when you start fasting. It should happen naturally, and you shouldn’t have to force it. 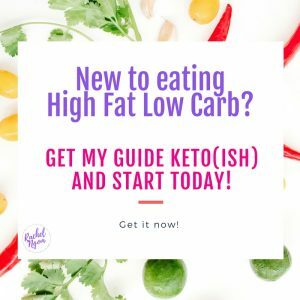 If you’re still a sugar burner instead of a fat burner, it’s going to be much harder…so if you’re serious about trying out this whole fasting thing, I suggest slowly transitioning to a high-fat low-carb diet. You can read about the benefits here. Ok, so you’re eating higher fat and you’re ready to start intermittent fasting…what fasting schedule is right for you? You might need to try a few different ones to see what feels right. What intermittent fasting schedule is right for you? Leangains was started by Martain Berkhan and is best for those who want to build muscle and shed body fat. This is personally the one I tend to follow most often and is easiest to stick with (in my opinion). All you do is fast for 14 hours (for women) to 16 hours (for men) each day, and then feed the remaining 8-10 hours. The easiest way to think about this is that you’re already fasting when you’re sleeping, so you’re probably already fasting for at least 8 hours every night. This just makes the fasting window a little wider, so you can eat dinner at 6 instead of 8, and push breakfast back to 10 instead of 7. During the fasting period, you don’t consume any calories, but I do still drink coffee and branched chain amino acids. This kind of fasting becomes easy once you are consistent with it for awhile. Your hunger hormones regulate to your feeding window, so as you push back your feeding window and you stay consistent with it, you won’t feel hungry until the hour you pick. During your 8-10 hour eating window, you can eat whenever…if you just want two big meals or 4 little meals, it’s totally up to you! I like to eat dinner early (before 6) and eat breakfast a little later (between 8-10, depending on how hungry I am that morning). This one is personally my favorite and is one of the more gentle intermittent fasting schedules. I think it’s easiest to stay consistent with and stick to long term! This intermittent fasting schedule was created by Brad Pilon and is best for healthy eaters who are looking for an extra boost. How does Eat Stop Eat work? All you do is fast for 24 hours once or twice per week. During the fast, you don’t consume any food but you can drink calorie-free beverages. After the fast is over, you go back to eating normally. “Act like you didn’t fast,” Pilon says. “Some people need to finish the fast at a normal mealtime with a big meal, while others are OK ending the fast with an afternoon snack. Time it however works best for you, and adjust your timing as your schedule changes,” he says. 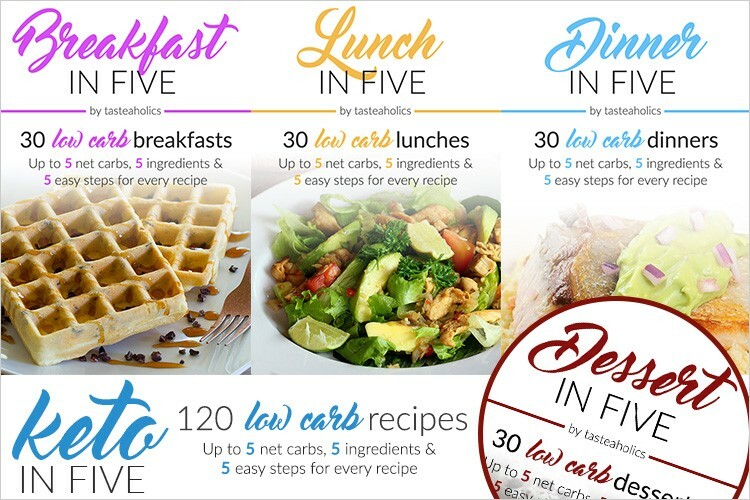 Eating this way will reduce overall caloric intake without limiting what you’re eating on non-fast days. It just limits how often you eat. Pilon doesn’t forbid any foods and doesn’t suggest weighing food or restricting your diet. While some may see this as a pro, I think it could be a con and lead to binge eating. I’ve tried this and it’s definitely not for me. The Warrior Diet was started by Ori Hofmekler and is best for people who like to stay busy all day and eat all of their calories at night. How does the warrior diet work? Essentially you fast 20 hours every day and eat one massive meal at night. It’s best for people who identify as ‘nocturnal eaters’, those who are programmed for nighttime eating. During the fasting phase, you can still eat raw fruits, veggies, a few servings of protein, or fresh juice, and is referred to as an ‘under eating’ fast. This is intended to maximize the Sympathetic Nervous System’s “fight or flight” response, which is supposed to boost energy, promote alertness, and stimulate fat burning. Some people like this way of eating because it saves a ton of time during the day (cooking, eating, and cleaning is time-consuming!). I personally don’t like it because I don’t like to go to bed on a full stomach. If I were to do a 20 hour fast, I would eat between 12-4pm. Alternate day fasting was created by James Johnson, M.D. and is best for the most disciplined people with a specific goal. How does it work? You eat very little one day (less than 500 calories), then you eat normally the next (2,000-2,500 calories). I’ve tried this and it is HARD. Especially if you’re working out on fasting days. You’re essentially cutting your calories by 20-35% each week by fasting every other day, so yes, you’ll probably lose weight, but I find it’s easier to binge on feasting days, which negates the fasting days. These are four different intermittent fasting schedules that you can try out (if you want). Keep in mind that we are all so different, and there is no one size fits all approach to eating (or not eating). If you do try fasting, I suggest easing your body into it. Don’t be a hero and do a 24 hour fast your first day! Start by eating dinner earlier and pushing breakfast back and see how you feel. Of course, remember that fasting (any of these methods) isn’t for everyone and if you have any medical conditions or a history of disordered eating, be sure to consult a doc before trying out fasting. 1. Drink lots of water! Staying well hydrated makes the fasting period much easier. I also like to add Branched Chain Amino Acids to my water. 2. Stay busy. Schedule your fasting times when you know you’ll be busy so you’re not thinking about fasting. For example, I scheduled writing this blog post in the morning lol! I’ll eat breakfast when I’m done. 3. Fast overnight. This way you’re sleeping through the majority of your fast! 4. Change your mindset. Instead of thinking that fasting is deprivation and you’re gonna die, think of it as just giving your body a rest from eating. There you go! 4 intermittent fasting schedules. Have you tried any of them? Comment below! PS. If you need more guidance with your health and nutrition and want a proven system to help you lose weight (without restrictions), join the Food Freedom Project here. Great article Thank you. Just wondering why a woman should fast for 14 hrs and men 16 hrs, I started with 14 hours and this week went to 16 hours.. should I rather stick to 14? I’m new to IF and feel like I’m having trouble finding information about what kind of workouts to do/ not do. Any guidance would be appreciated. I just started fasting two days ago, in order to lose weight. I ended up fasting for 16 hours, and after breaking the fast I just had a salad (approx 1000 calories) and started fasting again after 4 hours. It’s been 13 hours already and I’m not hungry at all. Is it okay if I start alternate day fasting as a beginner? As i really don’t feel dizzy at all. Hi Rachel! I am just doing research on IF and going to give it a try. 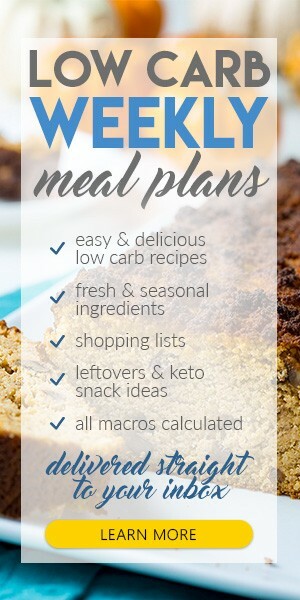 Did you count your calories and macros during your 8 hour eating window? Or just stick to clean eating? Thanks!